For some reason I was unable to the Fastvue Reporter website that I previously published on this server, and access to the back end IIS server was not working. The labiis server hosts a non-claims application which receives pre-authentication from labadfs using my AD DS account to log in. Requests pass through labwap and then to labadfs for authorization. The user receives the AD FS authentication page requesting their AD DS credentials which forwards them to the IIS server (labiis). Did you know: Fastvue Reporter also runs on IIS and produces clean, simple, web usage reports using data from your firewall that you can confidently send to department managers and HR team. The AD FS Server says it’s not possible for WAP to authenticate, and that there is something wrong with the certificate between both servers. If you look at all certificate thumbprints, you won’t find any starting with “50571..” mentioned in the WAP server event. You need to provide your credentials in order to execute the cmdlet. After running this cmdlet, the WAP server came back online and the configuration could be successfully retrieved from AD FS. The proxy trust certificate is a rolling certificate valid for 2 weeks and periodically updated. This is stored in an internal, protected store so you won’t see it in any of the usual certificate stores. What you see in the local machine store is the initial temporary certificate thumbprint used while the proxy trust is first being established. 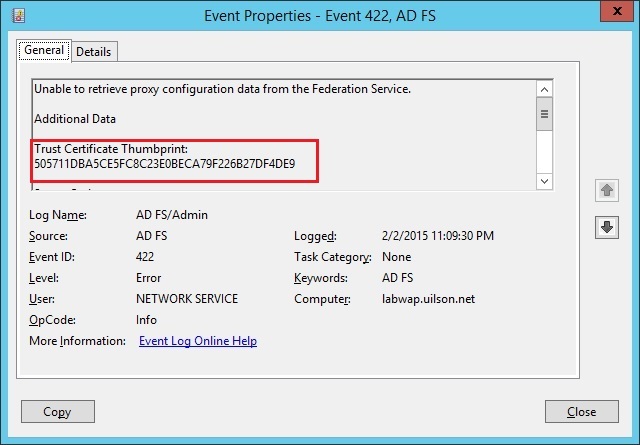 This explains why the WAP event log error included a strange, unknown certificate thumbprint. If you leave your WAP server offline for more than 2 weeks, the proxy trust certificate will expire and you’ll need to re-initialise the proxy trust (which is what I did with the Install-WebApplicationProxy cmdlet). This can also happen when you move your VM’s configuration to another storage – as was my case! I hope this helps anyone experiencing similar issues. Please leave your comments if you have any further questions! Take the pain out of reporting on Web Usage and Network Traffic. Fastvue Reporter produces clean, simple, web usage reports using data from your firewall that you can confidently send to department managers and HR team. Automate reports and get the job of reporting on web usage off your desk and into the hands of people that need it. Download the 30 day free trial today! You are missing a step, that may or may not effect different users. Run this command on primary ADFS server before Installing the thumbprint on the proxy server: Set-AdfsSslCertificate -Thumbprint xxxxxxxxxxxxxxxxxxxxxxxxx I don’t know what happened in my environment but that is a nightmare to troubleshoot. I need some help getting my ADFS up and running can you assist. Sorry for the delay! What issues are you having with ADFS? Although we don’t officially offer support for TMG itself, we do know a fair amount about it and are happy to help our Fastvue or WebSpy customers where ever we can! Currently setting up a Web Application proxy to publish our CRM externally. The WAP is non domain server in our DMZ and we have only allowed Port 80 and 443 inbound/outbound from the WAP to the internal ADFS 3.0 server which is a domain joined server and a member of our AD domain. 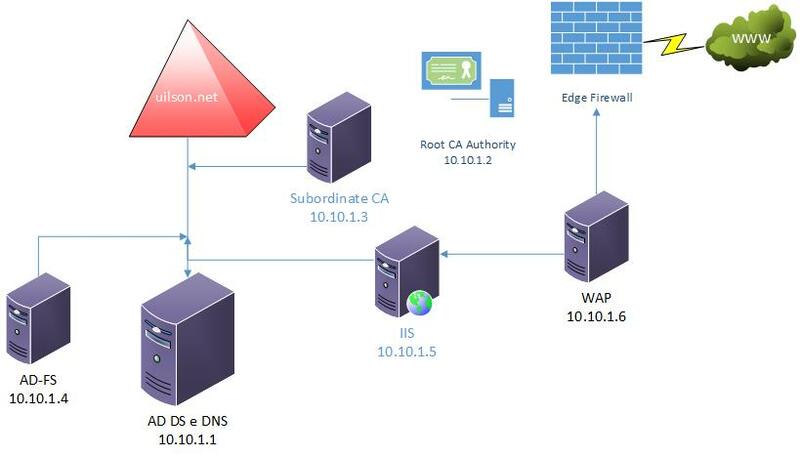 Had to create a local DNS entry on our WAP server using the hosts file to our ADFS server (sts1.orgname.com) and was able to configure successfully the WAP role and publish applications. 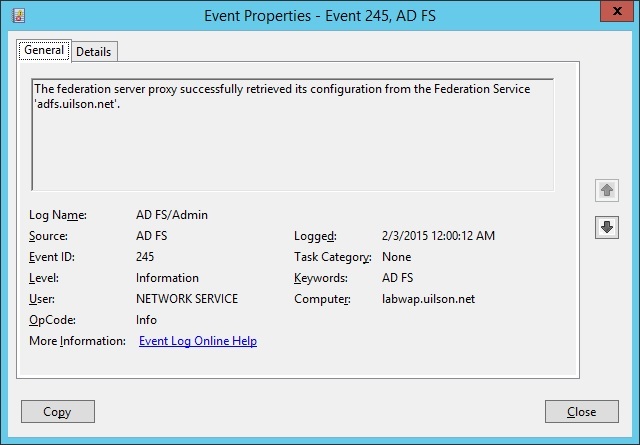 “The federation server proxy successfully retrieved its configuration from the Federation Service ‘sts1.orgname.com’. Get-WebApplicationProxyApplication Name* | Format-List replacing Name* with our own organization published apps name. if not, run the Install-WebApplicationProxy command. Now when I configured the WAP role I created a local user on the internal ADFS server and put this user in the ‘administrators’ group of the server and used this account to perform the initial authentication when configuring the WAP server under the WAP configuration wizard when it asks to enter the credentials of a local administrator account on the federation server. Would this account be sufficient or would I need to create a domain account in our AD and add this user in the local administrators group on the ADFS server and then use this account to configure WAP? Originally I used a San cert on this server but then realized we would have to create many more subject alternative names on the SAN cert, so to avoid this we used the wildcard. Is this configuration supported? Can I use a san cert and wildcard on the two different ADFS servers? Worked perfectly on my 2016 WAP server. When I added the WAP server it worked perfectly but for some reason, 2 hrs later it started to show this error. Your command fixed it. The credentials I entered were the ones for the ADFS service account and they worked just fine. This seems to occur randomly on the 2 WAP servers in our secondary data center. I haven’t noticed an every 2 weeks theme. It won’t work for the day, but then the next day it will start working again. 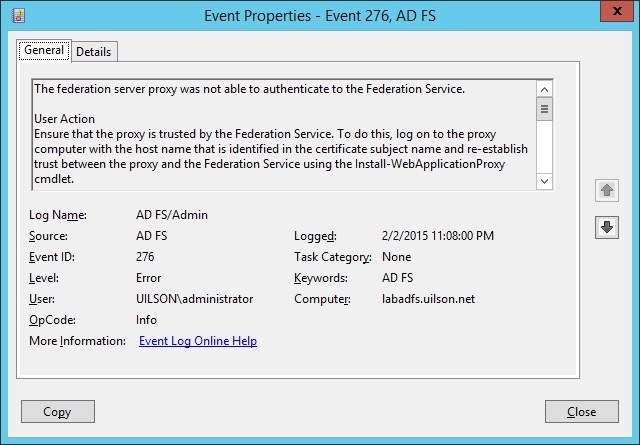 Excellent article with the details I needed for my final step to get our AD FS and Web Application Proxy back to functional after a cert update. Events matched up and your simple recipe to reinstall WAP to establish trust was right on. I was so psyched. Thank You!